I've been working on a number of new stories each of which will ultimately blossom into novelettes, novellas, or even a full-length novel. I have a number of new and continuing characters in the works. However, in the meantime, I was able to have an editor take a fresh look at my original novel Zombie Complex. She found a number of places where a comma would help, a few typos, some double words, a sentence or two that could be reworded, and a couple of other things that needed fixing in my original work. It was a bit humbling. However, the suggestions would substantially improved the quality of the novel. Thus, I jumped in and fixed all that needed fixing. 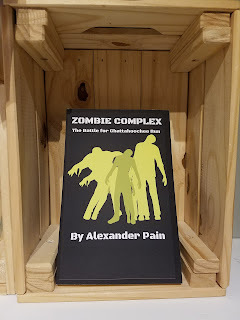 The result is a new edition of Zombie Complex. Inside the cover page, it says, "V2." If you haven't read the book yet, I think you'll enjoy it even more!